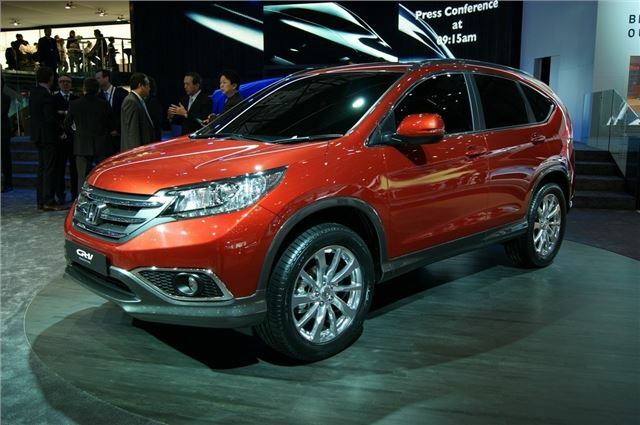 Honda has unveiled the new CR-V at the Geneva Motor Show. The model is already on sale in America and Japan but has been revised slightly for the European market. It will go on sale in September in the UK. The fourth generation of the CR-V is bigger and more spacious than the model it replaces and has a smoother look, although in our opinion it is no less striking and not as distinctive. The rear looks similar to a Volvo XC60 and although Honda says it has a more 'aggressive stance' it seems more generic than before. One new feature is a lower front bumper which integrates more smoothly with the body to improve wind flow. It will come with more efficient engines than before with an updated version of both the 2.0-litre petrol and the impressive 2.2 i-DTEC diesel which should be capable of around 45mpg. The four-wheel drive system is carried over from the current car and can send up to 100 per cent of the engine power to the front or rear wheels.